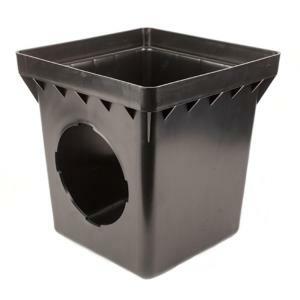 The Square Catch Basin is manufactured from UV stabilized High Density Polyethylene (HDPE). A catch basin is used to collect and disperse excess water to help prevent possible damage to landscapes from standing water. This catch basin is available with multiple side openings and one optional opening on the bottom which can be cut out along the perforations. Also, there are 4 small perforated drainage holes on the bottom of the basin which you cut out to remove standing water in the sump area. A variety of basin adapters attach to the openings to connect to 3" & 4" Sewer & Drain Pipe, 3" & 4" Corrugated Pipe or 3" & 4" Triple Wall Pipe or to connect to 6" Sewer & Drain Pipe and 6" Corrugated Pipe. A Basin Plug can be used to close off any unused openings. To raise the height of basin to grade, use a Basin Riser. For theft and vandalism prevention the basin comes with 4 holes to allow grate to be secured to basin. Great for using in grass areas, flower beds, decks, driveways, golf courses, medians, etc. Drain Hole Diameter 5/8" 5/8" 5/8"